Have you or a loved one suffered an injury? Is someone else to blame? Personal injury law is designed to cover all types of injuries an individual can suffer, from slipping and falling on a storefront sidewalk, to injuries from a dog bite or defective product. Personal injury cases amount to the largest number of civil litigation cases in the United States every year, with those stemming from car accidents at the top of the list. Individuals who have been injured due to another’s negligence may receive monetary compensation for their injuries. 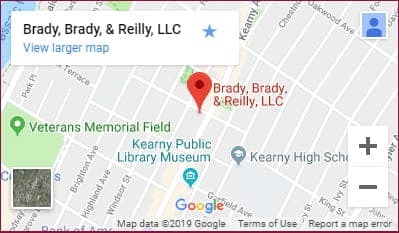 For more than 50 years, the Bergen County personal injury lawyers at Brady, Brady & Reilly LLC have been strong advocates for the rights of accident victims, successfully securing compensation for your injuries. What is “negligence” in New Jersey? The claim of negligence is at the core of all personal injury cases. Personal injury law is based on the premise that any injuries sustained, or any damages sustained to property, must be the result of negligence or wrongful actions on behalf of another person or entity. “Negligence” refers to a situation in which an individual acts in a careless or negligent manner, which results in injury or damage. Negligence involves legal analysis of the elements of negligence as they relate to the specific facts of a case and, by itself, is difficult to define. What type of compensation can I receive in Bergen County NJ? The individual or entity found legally responsible for the accident pays monetary damages to the victim. Damage awards may be agreed upon by both parties after a negotiated settlement or ordered by a judge or jury following a court trial.